Sealants serve a very valuable function. They are an excellent way to protect asphalt pavement from premature deterioration. Concerned About Cracks In My Asphalt – Why? • Sealants filter the UV rays that can cause asphalt pavement to deteriorate prematurely. • Sealants act as a barrier between the asphalt and chemicals that could soften it or cause other types of damage. Common chemicals found on asphalt pavement include automotive fluids, gas, oil and deicing agents. • Sealants make it easier for asphalt pavement to drain and in some cases may facilitate the melting of ice or snow. • Sealants help the asphalt retain its oils and moisture. Dried-out asphalt can become crumbly or more prone to potholes and cracks. In addition to protecting the asphalt, sealants also make it more attractive. It gives the pavement a darker, more even appearance. What sealants cannot do, however, is serve as a substitute crack filler. They simply lack the resiliency of asphalt, and they also lack the adherence properties that are needed for the repair to last long enough to make it worth your time and money. The material normally used for crack filling, on the other hand, is rubberized asphalt that is applied while hot — just like the asphalt that was used to construct the original pavement. Like the original pavement, the fill material will be resilient and pliable so that it will not crack under pressure. It will also form a waterproof seal. This is extremely important; if water reaches the foundation that supports the pavement, erosion can result that destabilizes the foundation. Without strong support, the pavement can quickly be damaged beyond repair. At the very least, the damaged asphalt will have to be removed and the foundation repaired before new pavement is installed. Crack filling is not an expensive procedure, but it can pay handsome rewards. 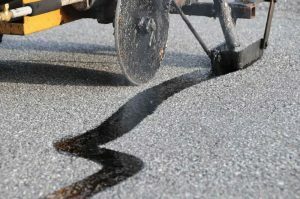 Asphalt professionals recommend that cracks be filled as they occur, but at minimum, cracks should be repaired before the onset of cold weather as freezing temperatures can make the cracks larger. Melting ice and snow also increases the risk of water penetration. If you need to have cracks repaired in your asphalt pavement, contact the experts at Asphalt Pavement Solutions. We have been delivering high quality work at competitive rates since 1983 to customers throughout the states of Pennsylvania, Delaware and New Jersey. Whether you need asphalt paving, repairs, sealcoating, parking lot striping or bollard installation, we can help. Request a free estimate by submitting our online form, or give us a call at 1-800-559-SEAL or 1-856-461-1710.